There used to be a time not so very long ago when the Christmas season officially began with “Black Friday”, the notorious shopping day following Thanksgiving. Prior to then, the only reminder you had that Christmas was not too far off was the downtown Christmas lights that the city would put up the week before Thanksgiving, a kind of subtle reminder, but not too much in your face and certainly never lit until Thanksgiving night. October was the time to be thinking about cooler weather and digging out the jackets, watching the leaves change and raking them up, school carnivals and the Fall Festival, plus Halloween fun, including the Jaycee’s Haunted House and Trick-or-Treating around town. TImes have changed however, driven by the need to sell, and even though it is still four weeks away, Halloween is already being crowded out of the stores by an early and insistent Christmas that is arriving far too soon for my tastes. The evidence is certainly there and it doesn’t take a forensics expert to see it. Just walk into a Target, a Wal-Mart or a Lowes and look around. Sure, the Halloween stuff is there, prominently displayed so you can’t help seeing it but lurking just beyond the rows of candy, the blowup pumpkins and the spooky creatures are sections that have already been set aside for a holiday that is still almost three months away. 82 days to be exact, assuming my post delivers on its intended date. 82 days before the BIG EVENT and here we are already having to choose between Candy Corn and Candy Canes. 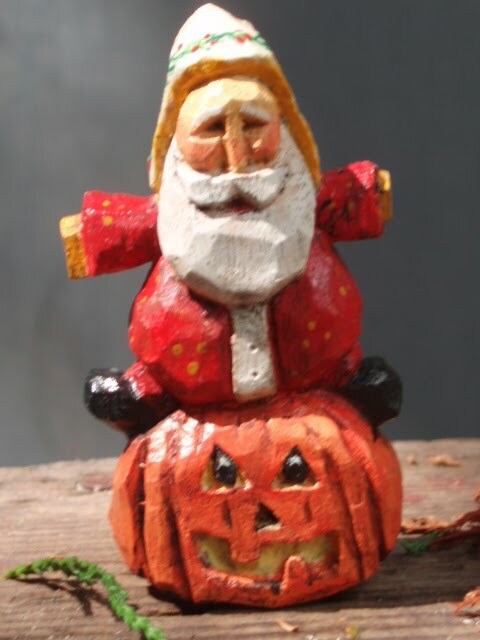 My wife hasn’t even begun her ritual of buying yellow mums, orange pumpkins and assorted harvest decorations, much less carved one into a Jack-O-Lantern yet and suddenly here comes Santa Claus, right down Shopping Lane. The Great Pumpkin never had a chance, Charlie Brown. When did it suddenly become so imperative that we turn our attention to Christmas when October is not even out of diapers yet? Where did the train run off the track? I suspect it has something to do with the way our society’s spending habits have changed and the need for businesses to sell more stuff. After all, we do have to keep China busy making the stuff we buy so they can loan us back the money we pay them for all the stuff they make. All political rantings aside though, apparently at some point, someone thought it would be a good idea to bump Christmas up a little earlier and get people in the mood to shop for it a little earlier. I’m told that back in the old days, when my grandparents were children, that Christmas trees went up on Christmas Eve, stayed the week of Christmas and had to be down by New Year’s. If you didn’t take it down by New Year’s, you were in for bad luck. Of course some of these folks were also the people who told me they walked six miles to school each day with no shoes in a snowstorm, chopped wood for the schoolhouse and built a fire to heat the classroom. Still, to hear them tell it, they were grateful for the oranges and nuts and socks and the Nickel that they got. For them, it was about being together as a family and celebrating the birth of Christ. The gifts were tokens of love and affection, secondary to the reason for the season. Things were better for my parents. At least they had radiant heat in school and Ovaltine to drink. They actually got a toy or two on Christmas. By the time my brother and I came along, the Christmas season pretty much began about two weeks before when school let out for Christmas break. The six-mile snow treks were pretty much a thing of the past and we might be using our air conditioning in December given the peculiarities of Georgia weather in general. The only snow we saw was when the TV stopped broadcasting at the end of the day. Toys were plentiful but not overwhelming. Despite it all, Christmas came in its own good time and not too early either. We looked forward to Autumn first and all that went with it, enjoying our own rituals and traditions. We knew that whatever night in October that the County Fair opened up would be the first day of the season that the temperature would inevitably drop. It didn’t matter if it had been 85 degrees earlier that day, our Fair always managed to coincide with the first Canadian cold front of the season, dropping the temperatures suddenly into the 50’s and bringing with it the windbreakers and light jackets. Nothing smells better on a cool, breezy night than the aroma of popcorn and cotton candy mingled with burgers expertly grilled by the Exchange Club. We looked forward to the Fall Festival and all the fun and entertainment that went on around a busy and lively town square. There were crafts and food and fun things to do, usually a live band in the evening and sometimes a parade. The County Fair and the Fall Festival were the cornerstones of a season that was just getting started. Our school would hold a Halloween carnival with each room decorated in a different theme or activity by each class, from Kindergarten to 12th grade. There were cake walks, apple bobbing, fishing for toys behind a sheet, Bingo, a haunted classroom or two and a dinner of chicken stew before the festivities ended. As Halloween drew closer, the Jaycee’s Haunted House would open, providing screams and thrills for children of all ages. Only in a small town is it acceptable that the current Mayor got to chase kids around in a strobe lit room with a chainsaw (minus the chain of course) and some of us were lucky enough to get to help them in the weeks of preparation it sometimes took to turn an old condemned house into something fun and exciting. Finally the event itself would arrive, the culmination of the month of October as scores of children took to the streets in a variety of costumes, some store-bought, some homemade, to scare some candy out of the accommodating neighbors. The rewards were rich in more ways than one and the memories were and still are lasting. I honestly can’t remember Christmas ever crossing my mind during all the fun going on in October and that is as it should be. Now we can’t help but think about it because it’s already around us, in the stores, on the television and in the news. If you ask most people on this day whether they are looking forward to Christmas, most of them will make a face, followed by a remark of how much they are NOT looking forward to it. “I can’t even think about Christmas now” one might say or “Why are you bringing that up this early?”another might answer, yet the stores seem to want us thinking about it now and it seems to get earlier each year. At the rate they are pushing it on us, it won’t be long before we find American flags and fireworks on the aisle next to Christmas trees and lights, with everything in between forgotten about. Ok, maybe that’s an exaggeration but if you think about it, haven’t you noticed how we push Christmas so much earlier than we used to? October 1st used to mean the start of the fall season, not the start of the Christmas season. We made time for each one of the holidays and the traditional events that surrounded those times of the year, giving each their due and reaping the rewards and benefits they offered. We didn’t crowd Halloween with Christmas but rather, we gave each their due and enjoyed a little pause between them all. Oh, and by the way, in all the charge towards Christmas, let’s not forget the holiday that falls right in the middle of all this and that I think is the second greatest of all the holidays we celebrate….Thanksgiving Day. I actually look forward to Thanksgiving almost as much as I do Christmas because for me, that holiday is like Christmas without all the hassle and shopping and debt…its the closest thing to the traditional Christmas I think of….together time with family, lots of food, making memories and observing traditions. It’s a holiday for us to just be thankful for what we have, whether that be great or small. In our modern society’s haste to crank out the Christmas spirit starting in October, we not only rush our way through the best part of the year but we run the risk of making Halloween fun and Thanksgiving traditions mere footnotes in the overall holiday season. What used to be the Christmas Rush has suddenly become the Rush to Christmas. Slow down the sled Santa! Give us a chance to savor the change of the season and enjoy the beauty of autumn, the smell of burning leaves, the coolness in the air and the explosion of color that reminds us that even in the South, the summers must eventually come to an end. Give us at least until Black Friday before pummeling us with ads, choking the stores with Christmas decorations and sending out the message to BUY everything you can. Light the lights on Thanksgiving night and start churning out the Christmas music then if you must but don’t take away all the wonder and fun and festivities that come before. In the long run, we’ll appreciate it a lot more if we have a little less of it. So true. Halloween and Thanksgiving are two of my favorite holidays. I’m in no rush to get to Christmas. I just want to enjoy and savor each holiday. There is so much to be enjoyed during the other holidays that can easily get overshadowed by Christmas. It will come and be enjoyed just as much as the others. I LOVE FALL and I have a continuous disagreement with one of the young men who works at the church where I work about playing Christmas music before Thanksgiving has even gotten here. Thanksgiving is my favorite holiday and I want to savor it not just jump-skip it so we can get to Christmas! Although I do Christmas shop all year long, my rule is no Christmas music until the day after Thanksgiving. Don’t get me wrong, I love Christmas and it is really my favorite time of the year, more than just the day by itself-but when it is extended for months just to get people in the mood to spend money, it loses its significance and all the wonder that goes with it. Thanks for your reply Gail! Because of the ever-more-early rush to get those dollars in so that the businesses can gauge how well they did this year, I find that I refuse to do anything remotely Christmas-y until at least Thanksgiving. I’ve always put up the tree that weekend after (artificial tree for many years now, due to family members with allergies) and get decorated as the month progresses. In the past however I used to begin shopping in the late summer and stash things away, but now I wait until December proper to even think about it.